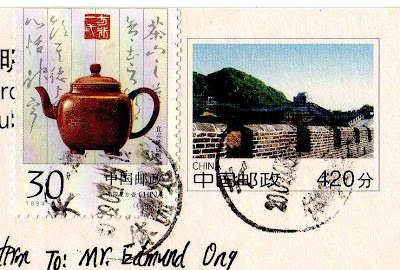 eD@HoMe: Postcards from Italy, Malaysia, Lithuania & China! Postcards from Italy, Malaysia, Lithuania & China! For today, I have chosen 4 beautiful postcards that I have received through postcrossing and private swaps recently. 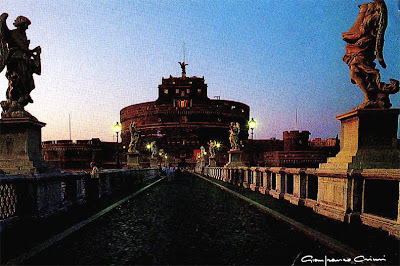 The first postcard of the day is this lovely card sent by Giovanna from Rome in Italy. Thank you very much! This postcard depicts Castel Sant'Angelo in Roma. The quality of the postcard scan did not do justice to this gorgeous structure. So I have included a few photographs (which I have found on the World wide web) as well. 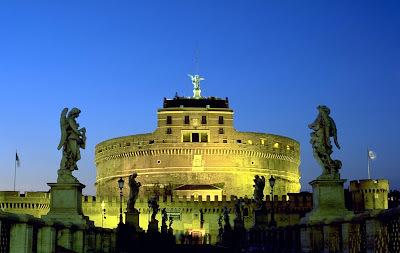 Castel Sant'Angelo is a massive fortress on the right bank of the Tiber, about a mile from Saint Peter's Basilica, in Rome. 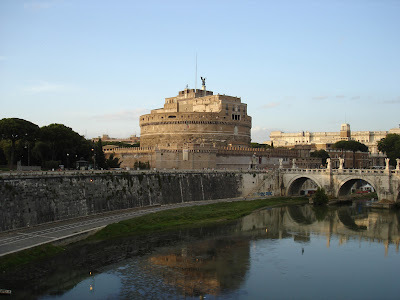 Originally built (A.D. 135-39) by Emperor Hadrian as a mausoleum for himself and his successors. It was later decorated and fortified as a place of refuge for the popes. In 1277 it was connected to the Vatican Palace by a secret passage, The Vatican Corridor, to provide an escape route when the pope was in danger. 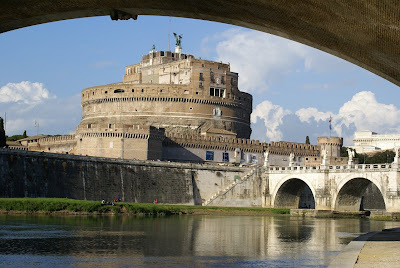 The bridge across the Tiber was built at the same time as the Mausoleum of Hadrian (in 134) and was named Ponte Elio, but when the mausoleum became a castle and took the name of Sant'Angelo, the bridge took the same name. 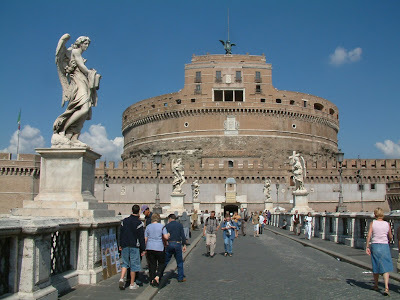 In 1669 Pope Clement IX had Bernini design 10 statues on the balustrade, of angels holding the symbols of the Passion. Two of them were made by Bernini himself and the other 8 statues are work of his pupils. 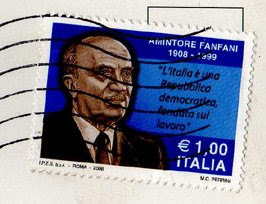 The stamp on this card features Amintore Fanfani (February 6, 1908 - November 20, 1999). He was an Italian politician and five times Prime Minister of the Republic. He was one of the well-known Italian politicians after the Second World War, and a historical figure of the Christian Democracy. The stamp is a single issue. The second postcard was sent by Khor from Singapore's closest neighbour, Malaysia. Thank you! 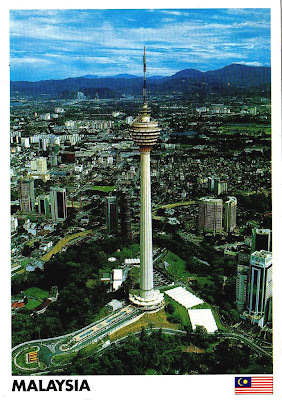 This lovely postcard shows the impressive Kuala Lumpur Tower. It is officially known as Menara Kuala Lumpur or KL Tower. It was built in 1995 and located in Malaysia's capital Kuala Lumpur. It is used for communication purposes and features an antenna that reaches 421 m (1,381 ft), which currently makes it the fifth tallest tower in the world. The roof of the pod is at 335 m (1,099 ft). The rest of the tower below has a stairwell and an elevator to reach the upper area, which also contains a revolving restaurant, providing diners a beautiful view of the city. I have visited Kuala Lumpur a few times but have not had the chance to actually visit this magnificent tower yet (only saw it from afar). Come to think of it, it has been a quite a while since I visited Malaysia... hope to do so soon! The bird stamp belongs to a set of 8 stamps from the Bird series, issued in 2005. 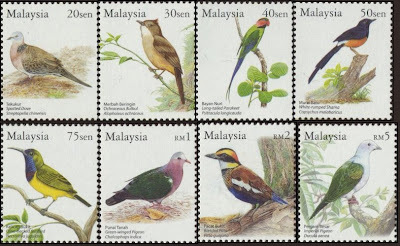 The birds feature in this series are: Spotted Dove (20 sen), Ochraceous Bulbul (30 sen), Long-tailed Parakeet (40 sen), White-rumped Shama (50 sen), Olive-backed Sunbird (75 sen), Green-winged Pigeon (RM 1), Banded Pitta (RM 2) & Green Imperial-Pigeon (RM 5). 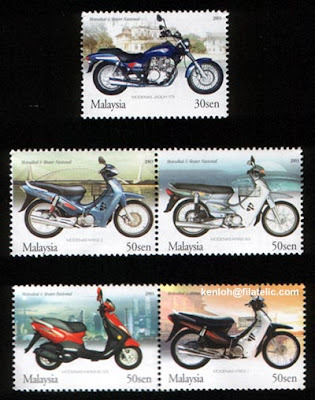 The second stamp is part of the Motorbikes Series, issued in 2003. Next we have this lovely postcard from Lithuania. Thanks Elena! 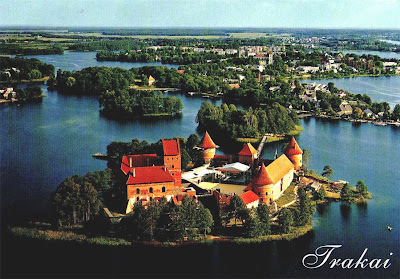 This card shows Trakai Island Castle. It is located in Trakai on an island on the shores of Lake Galve. The castle is sometimes referred to as "Little Marienburg". The construction of the stone castle was begun in the 14th century by Kestutis, and around 1409 major works were completed by his son Vytautas the Great, who died in this castle in 1430. Trakai was one of the main centers of the Grand Duchy of Lithuania and the castle held great strategic importance. The stamp used on this postcard is from the EXPO Zaragoza 2008 Series. It is a single issue. 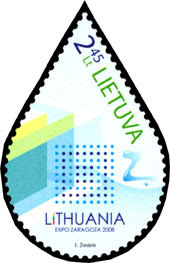 It was the first time that a water drop-shaped postage stamp was issued by Lithuania Post. The main topic of the world exhibition EXPO Zaragoza 2008 (Spain, 14 Jun– 14 Sept 2008) is "Water and Sustainable Development". 104 countries and an estimated 8 million people participated in the exhibition. Last but not least, we have this beautiful postcard sent by fellow blogger, Wang Gang from Tianjin. Thank you my friend! On this card is the greatest wonders of the world, the famous Great Wall of China. It was enlisted in the World Heritage by UNESCO in 1987. Just like a gigantic dragon, the Great Wall winds up and down across deserts, grasslands, mountains and plateaus, stretching approximately 6,700 kilometers (4,163 miles) from east to west of China. With a history of more than 2000 years, some of the sections of the great wall are now in ruins or even entirely disappeared. However, it is still one of the most appealing attractions all around the world owing to its architectural grandeur and historical significance. The Great Wall was constructed using the Chinese people's sweat, blood, and muscle. 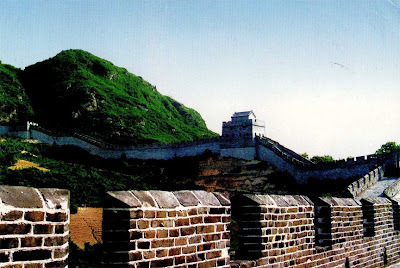 Many legends have survived about the construction of the Great Wall. 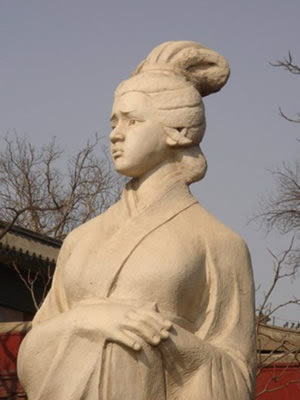 Among them, the most popular is the story about Lady Meng Jiangnu. On the night of their wedding, Meng Jiangnu's husband was conscribed to work on the Great Wall by the Qin soldiers. Before he went away, Lady Meng broke her white jade hairpin in two and gave her husband one half as a token of love. One day, lady Meng dreamed that her husband was constantly yelling "Cold, cold". She recalled that her husband was wearing very thin clothes. She made some padded clothes for her husband and left home to look for her husband. She didn't realize that her husband had already died of exhaustion. Upon hearing this, she burst into tears. The Great Wall was moved and more than 20 Kilometers collapsed, revealing the body of her husband and many others. On seeing this, she committed suicide by jumping into the sea. 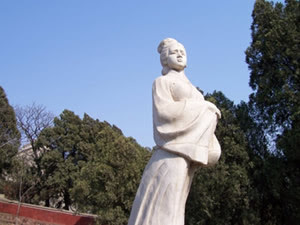 A temple can be found at Shanhai Pass near the sea in memory of this loyal lady. It is often said "If you haven't climbed the Great Wall, you haven't seen China." No China tour is complete without seeing the Great Wall. Visiting it is the experience of lifetime. 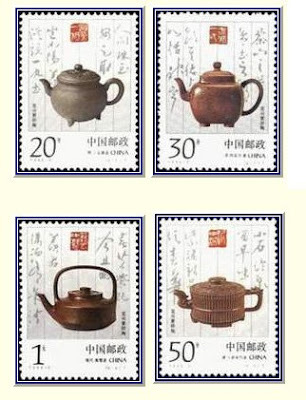 On the postcard is a stamp from the Clay teapots series, issued in 1994. The other stamp is a pre-printed stamp on the postcard.